St John’s joined the national speaking and listening event run by the Communication Trust because the staff at our school believe in the importance of speaking and listening throughout the curriculum. Spoken language and the development of vocabulary and good communication are important for children’s development in both education and their lives outside school. Each class took part in several exciting lessons that encouraged good classroom talk and discussion. Reception children took part in a sound walk around the school. Year 1 used egg boxes to extend their maths. Year 2 created a poem about spaghetti that they then performed. 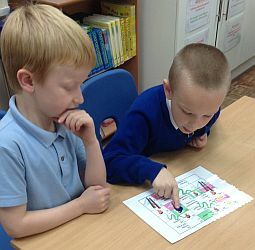 Year 3 used straws to create 3d shapes and played snakes and ladders in Spanish. Whilst, Year 4 solved the mystery of the missing pen.